Belhaven partnered with Capture Higher Ed to introduce and drive prospective students to the university’s new Academic Scholarship Calculator located on a landing page Capture created. 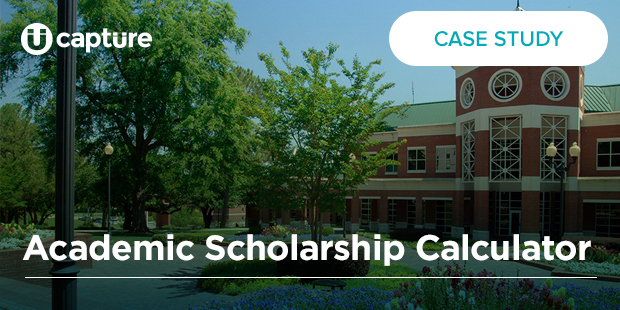 Capture sent out a CBE-powered, ad hoc email on behalf of Belhaven to more than 20,000 prospective students introducing the Academic Scholarship Calculator. All of the form submissions went to a new “PID Forms Inbox” for the university’s admissions team to easily download. Using CBE, marketing automation technology, Capture also increased identification by tracking every visitor that clicked on the link and filled out the form. The calculators represent a new way of providing potential students with awarding amounts while encouraging them to engage with our partners. By giving prospects a link in the email to the calculator, Capture allows students to input their own information to view their own award eligibility. It gives the student an accurate picture of how much aid he or she is likely to receive as well as helps the school collect GPA and standardized test scores in cases they didn’t already have them. Out of the 2,600 prospective students who opened the email, 394 went on to click the link to the calculator — 14.9 percent. Out of the 394 who visited the landing page, 251 visitors completed the form — a 63.7 percent conversion. The 251 visitors completed the form in less than 24 hours. Since the initial launch, there have been over 481 submissions to date. Belhaven University is a private, Christian liberal arts university in Jackson, Miss., educating more than 5,000 undergraduate and graduate students. "Capture continues to push our industry forward with the most innovative technologies. CBE has been great for targeting very specific groups. For example, we recently spent two weeks promoting a dance audition to both known and anonymous students visiting those pages and had a click-through rate of over 15%, generating increased interest."